Well, we have successfully moved from Hawaii to Utah, where we bought a house that we immediately had half of renovated. Thankfully, we had a truly wonderful contractor who treated our home as if it were his own and went above and beyond our expectations! One large room in the downstairs of our 1978 split level was tagged for my sewing studio. I have been so excited about bringing my sewing class business here to Utah and knew that a separate set-up would make things so much easier than using my dining room like I was doing in Hawaii. Anyway, without further ado, here is the end result! 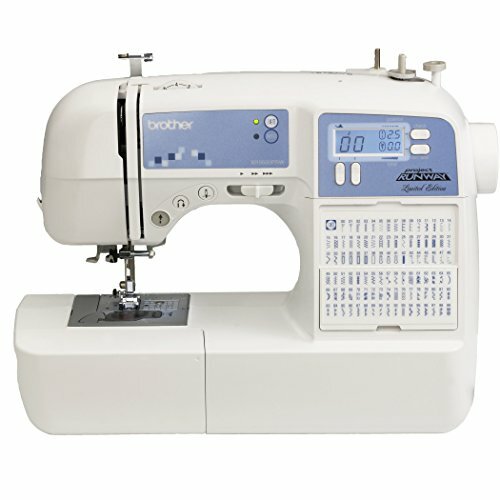 I upgraded the four mechanical Brother machines I had to six new computerized Project Runway Brother machines (affiliate link). They have already made my life so much easier!! A couple reasons: First, they have speed control, which is a no-brainer when teaching kids, I have learned. Second, they have certain features that prevent me from having to constantly rethread or unclog the thread. For example, if you try to sew without the presser foot being down, you'll get an error code. Also, I've already used the fancy stitches, the alphabet, the button-holer and and button foot and they all work like a dream! These machines cost $160 on Amazon and I highly recommend them! I'm happy to say I've already put it to good use, not only sewing for myself and with the girls, but I've already held a couple classes here and this space was a dream to work in! The large cutting table is something we got on Craigslist because it was part of a handmade set. My husband is using it's taller partner, but this thing was way too big for my dresser and I already have a dresser I like. So I painted it blue, added cool drawer pulls and had Casey put a new, larger top on it to serve as a perfect cutting table that also holds ALL of my fabric and then some! Casey even put it on castors so if we need this floor space for other uses, this can be pushed to the wall and sewing machine tables (which are from IKEA and were given to me) can be pushed to the other wall. The little stools were actually taller stools we already had, but aren't using. I asked Casey to cut them shorter and they're perfect and don't take up space like bulky chairs would. The curtains were ones I made for our bedroom two states/homes ago. Glad I kept them! My personal sewing space is at the far end, along with the ironing station. I gave myself the mountain view, it's so pretty out that window. That wooden cabinet my father-in-law made me years ago and it holds notions and things. The retro metal desk was a side of the road rescue that I painted, also many years ago. This vanity was a gift from my Dad, which made over for me one Christmas when I was young. I gave it a fresh coat of paint a couple years ago and I love it in this space now. Everyone needs a mirror in their sewing space! I hope you've enjoyed the tour! I'm certainly enjoying the space. I already have more classes planned, so I'll soon have photos of it in use, I'm sure.